Our Groucho does Groucho’s voice and mannerisms so well that you forget that you are watching and hearing a lookalike and an impersonator! The DLE Marx Brothers are the best in the business. Watch their A Night At The Opera sequence “Don’t you know–there ain’t no sanity clause?” on their video. Chico sounds and looks JUST like the original Chico and Harpo is a dead ringer for the original Harpo. David Levin Entertainment’s Groucho has appeared in numerous films including Back To The Future film sequels with Michael J. Fox. 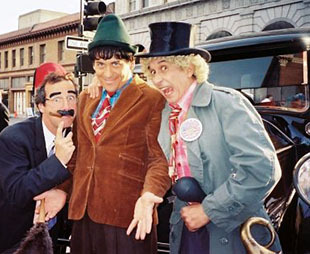 He and our Marx Brothers are perfect for corporate events, conventions and private parties as lookalikes only or as impersonators doing their outstanding routines.